This site will soon appear very different. Since September of 2011 it has done one thing. It’s been a column, of sorts, or a series of swimming essays, each around 1,000 words. At first they went up weekly, then it became a little more sporadic, with new posts popping up when it felt warranted. Thank you, to everyone reading this, for supporting – and sometimes indulging – this long-running commentary. Now it’s time for something more. In a few weeks, Cap & Goggles will relaunch as a site that celebrates the ‘aquatic arts’. The commentary will still be there, with these columns anchoring the lead section of the site. However, I can’t wait to introduce the new content. It will include Books and Videos and Art and Photography — anywhere that swimming finds artistic, creative expression. My voice will be joined by many other, more talented creative voices, whether they’re capturing our sport on canvas, on camera, on film, or between the pages of a book. Have you read this terrific memoir by Leanne Shapton? Leanne is a friend and fellow Canadian swimmer, and if you swam in or near Canada in the late 80s and early 90s, you’ll surely recognize some of the characters that populate these pages. Swimming Studies won the 2012 National Book Critics Circle Award for Autobiography. For good reason – it captures the feeling of what it means to be a swimmer as well as anything published. It’s about the lonely moments, the forgotten sensations that still fill your dreams. And it’s filled with haunting honesty like this: “When I swim now, I step into water as though absent-mindedly touching a scar. My recreational laps are phantoms of my competitive races.” Yeah, it’s that kind of good. 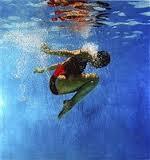 Eric Zener is a Northern Cal based artist well known for his underwater themes. Out of his studio in Sausalito, Zener creates work that leaves you both breathless and buoyed by his vision. If you’re a former swimmer, viewing his paintings is like being comforted by the phantoms than Shapton writes about. In New York, his work can be found at a gallery not far from where I write this. I met him once there, and unsurprisingly he told me that all three of his children are swimmers in the Bay Area. Congrats Casey! Can’t wait to see the new look! I’ve enjoyed your column. Looking forward to more! I enjoy reading your column. I hope you’re going to keep your tagline – “only a swimmer knows the feeling”. Looking forward to diving in again after the relaunch. Not to worry, tag line stays!